Every year Key Club officers have the chance to receive the distinguished officer award for their exceptional job as an officer. Officers are selected based on attendance at events, their outstanding job as an officer, and fulfilling all of their job requirements. 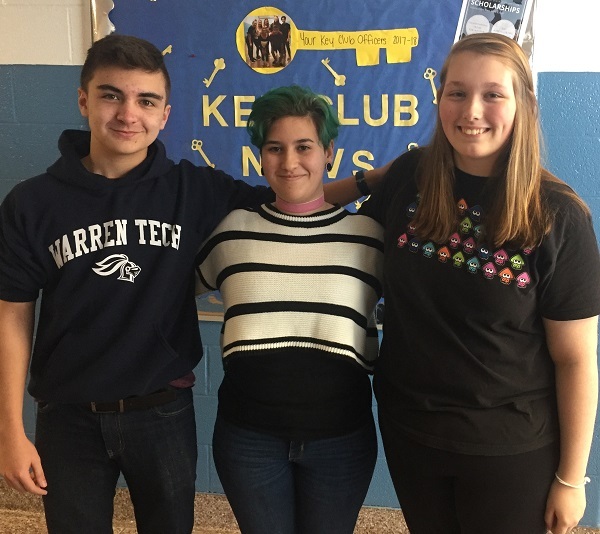 This year three Warren Tech Key Club Officers earned the Distinguished Officer Award. The local governing body of the Key Club chose Julia Soares (President) Richard Cruz (Vice President) and Kaitlyn Reinbold (Secretary) to receive these awards. They will receive their awards at the NJ District Convention in March. "The three of them have been working hard to connect our club to the greater organization," said Key Club Advisor Mrs. Seugling. "They have attended many events this year including a weekend long seminar (Key Leader) which is a fantastic event that trains teenagers for leadership positions." The Key Club organizes events and participates in community service opportunities in the community. For more information about Key Club click here .